My grocery store ran a 2-for-1 special on pork shoulders a couple of weeks ago and I used one of them for Pork Tinga and breakfast for dinner. That was all well and good, but I had another shoulder in the freezer and wanted something more substantial than plain old (delicious) pulled-pork. I wanted something that could be a meal in and of itself, and that meant it had to be more than a giant mound of (delicious) pork. So, I decided to try and make a stew-ish concoction by combining the things I like, omitting anything I don’t like (I’m looking at *you*, Brussel’s Sprouts and Brocolli) and cooking it all up in the crock pot. This turned out fabulously, with some room for spicey improvement the next time around. I combined a pound of dried navy beans, soaked overnight in water (pinto beans would work very well here too), with two cans of diced tomatoes and chilis and a large white onion (chopped roughly). To prepare the shoulder, rinse under cool water and pat it dry, then season generously with salt and pepper or your favorite dry-rub. I used Emeril’s Essence. Heat a heavy pot or skillet over high heat and aggressively sear the shoulder on all sides. By “aggressively sear” I mean let the skillet get good and hot and then add the shoulder, allowing it to sear undisturbed on each side for 2-3 minutes per side. Yes, it will sizzle and smoke, that’s the sign that you’re doing it right. You want good, dark color on the pork. Remove the seared pork to your crock pot, turn the heat down to medium and deglaze the skillet with 3/4 cup white wine or water, scraping the skillet to recover any pork leavings. Pour the resulting liquid into the crock pot. Add all the remaining ingredients to the crock and enough stock or water to cover the meat. Cook on high for 8+ hours. Remove the pork to a cutting board and let it rest for 10 minutes, then shred with two forks or tongs and return it to the crock pot. 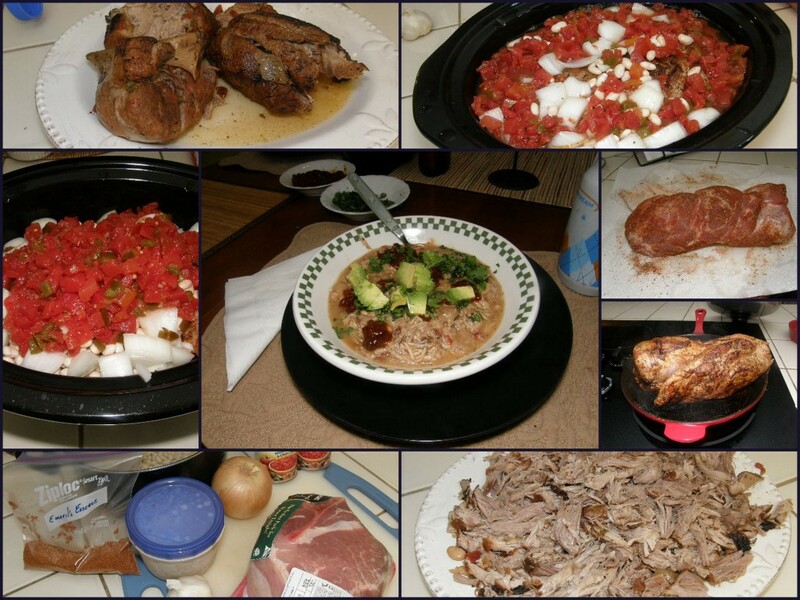 You are essentially done cooking your Mexican Pulled Pork Stew. You can serve it immediately or cover and refrigerate/freeze it to serve sometime in the future. We did both. 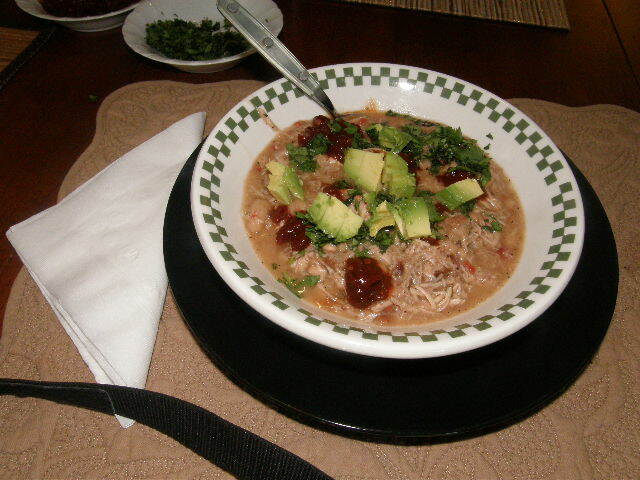 Seen above, I garnished each serving with some cilantro, chopped avocado, minced Chipotle in adobo and a squeeze of lime juice. It was delicious. Then, I froze leftover individual servings for future lunches. Win Win! Rating: I give this 4 out of 5 Negra Modelo beers. I think I under-spiced the first version of this, although it was tasty as it was. Remember the 5 pounds of pork and 1 pound of beans can take a *lot* of spice. Next time I’ll add one or two chopped jalapenos to turn up the heat and maybe some bell peppers to the mix. This entry was posted in 4 Wine Glasses, Dinner, Pork. Bookmark the permalink. Try adding tomatillos, too. I make a similar recipe and they are awesome in it. That is an awesome suggestion, and I’m a little chagrined that I didn’t think of tomatillos myself. Thanks for the suggestion!